The 2018 Dissertation Award recipients are Douglas Guilbeault, a PhD student in the Annenberg School for Communication at the University of Pennsylvania, for his proposal “The Network Dynamics of Interdisciplinary Research”; Charu Gupta, a PhD student in the Wharton School of Business at the University of Pennsylvania, for her proposal “The role of collaboration networks in science productivity”; and Elan Segarra, a PhD student in the Department of Economics at the University of Wisconsin-Madison, for his proposal “Describing Heterogeneity in Research Projects Via Classification of Expenditure Profiles”. The 2018 Early Career Award recipients are Jason Coupet, Assistant Professor of Public Administration in the School of Public and International Affairs at North Carolina State University, for his proposal “Measuring the Efficiency of the Research Enterprise”; and Jonathon Mote, Assistant Professor in the Department of Organizational Sciences and Communication at the George Washington University, for his proposal “Using UMETRICS to Assess Collaboration Among Universities and National Laboratories”. Research abstracts are available on the IRIS webpage at http://iris.isr.umich.edu/research-grants-awardees/. 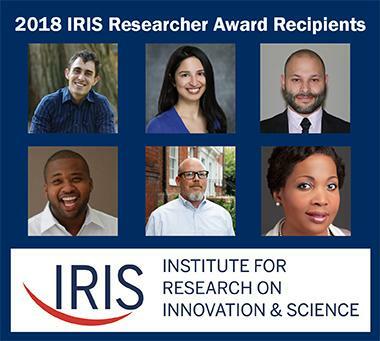 IRIS is a consortium of universities anchored by an IRB-approved data repository hosted at the University of Michigan’s Institute for Social Research. IRIS was founded in 2015 with support from the Alfred P. Sloan and Ewing Marion Kauffman foundations. IRIS collects record level administrative data from its member institutions and uses those data to produce secondary de-identified research data that can support research and reporting that will improve our ability to understand, explain and improve the public value of research.